I completely understand if you thought this was a repetition of yesterday’s post. It took me a minute to sort out the difference between these two movies, as well. Although they’re playing on the same theme, however, they are actually very different films. This is signaled by the opening title card where the typical Keystone words “farce comedy” have been replaced by “educational.” Audiences were warned – this is not the funny romp we got in San Diego. 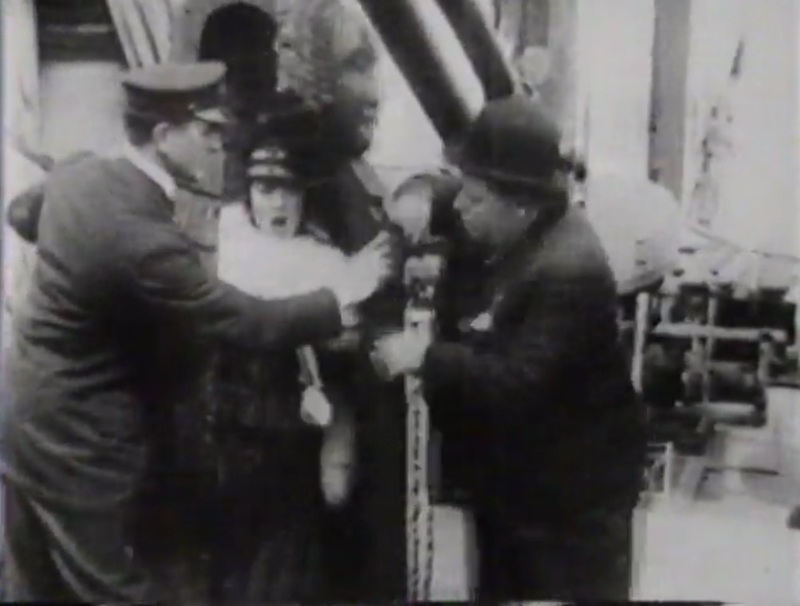 Instead, what we see is Roscoe “Fatty” Arbuckle and Mabel Normand very much out-of-character, behaving like two V.I.P.’s giving live coverage to a public event. In fact, they remind me of the hosts of the annual Macy’s “Thanksgiving Day Parade” television coverage. They clown a bit, but just enough to give a bit of relief to the pageantry of the World’s Fair. First, we see the Battleship Oregon, which had served during the Spanish-American War and had not yet become a floating museum in Portland. During the Second World War, the navy would reclaim her for scrap, but at this time she was still known as the “Bulldog of the Navy.” Next, we get various Bay-view panaromas of the pavilions and buildings constructed for the fair. Now Fatty meets Madame Ernestine Schumann-Henk aboard ship; she is a famous opera singer, and she rapidly claps her hand over Fatty’s mouth when he “warbles” for her. 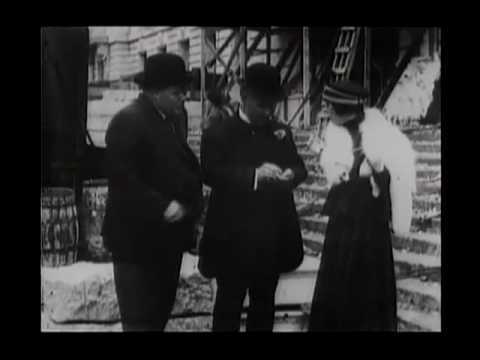 More footage of the sights of the Fair and San Francisco is followed by a meeting with the Mayor, James Rolph, Jr. He magnanimously writes them a card giving permission to “take pictures anywhere in the fair.” Then they proceed to the “Prison ship” Success, where various instruments of torture are on display, including an iron maiden, which seems an unlikely thing to take on a sea voyage. Mabel gets into the maiden, to try it out, and Fatty almost closes the door on her. Finally, we are treated to a very nice shot of the fairgrounds lit up at night, with a “captive aeroplane” ride dominating the landscape. While this movie is far less entertaining than the comedy in San Diego, it is interesting historically. 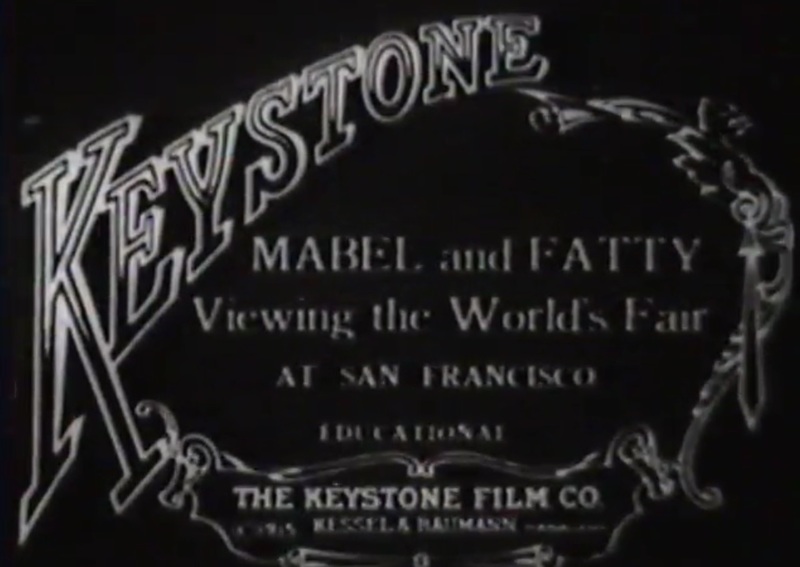 Obviously, Keystone felt that their two biggest stars, plus the extravagance of the fair itself, could carry the film without a comedy plotline. The scene with the mayor may offer a hint as to why this happened – getting permission to shoot just might not have been as simple as it was at the earlier fair. Or, someone at Keystone may have felt that sending a camera crew 400 miles to San Francisco (as opposed to 100 miles to San Diego), warranted a less risky approach. What will interest people is the footage of post-Earthquake-recovery SF. Some of the buildings of the World’s Fair still stand and even serve as tourist attractions, including the “new” City Hall we see under construction on Market Street. Various views will be familiar to San Franciscans today, although the sheer size and elaborateness of the event outdoes the current waterfront. The early jitney cabs may be of interest to aficionados of classic cars, and the ships to naval historians. All in all, this is a more “interesting,” less exciting movie.